Staying competitive on the road toward autonomous driving means being on the cutting edge of ADAS and automated driving development. Increasingly sophisticated functions are accompanied with growing complexity and high expenses. More and more effort needs to be put in development, testing and validation activities as well as the generation of reliable data. EB Assist stands for state-of-the-art hardware and software products to successfully develop, test, visualize, validate, and build ADAS and automated driving functions and systems. EB Assist covers major areas of ADAS/AD development, from creating driving scenes, replaying, and simulation to testing, visualization, validation and function development. Our products comprise two decades of embedded software and driver assistance development experience leading OEMs and Tier 1s across the world benefit from. EB Assist products are perfectly suited for you to fulfill the high requirements when it comes to build flawless automated driving functions. Furthermore, our products are backed by a comprehensive in-house hardware and firmware development. One contact point in case of issues relieves you of the tedious task to find the right company to solve your problem within a complex solution. 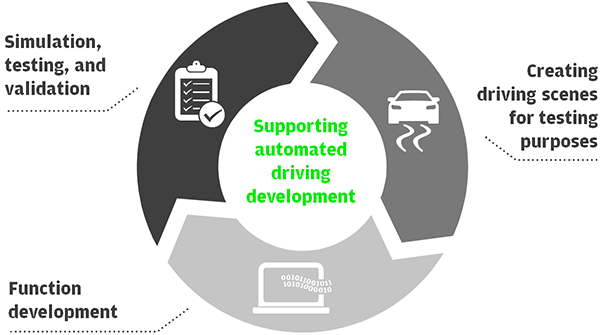 EB Assist, together with proven partners, offers high-performant, integrated, customizable, extendible hardware and software products allowing seamless integration into any desired development and test process environment and therefore cover the whole automated driving toolchain. Dedicated trainings, professional consulting, and experienced support with short respond times help you in achieving your goals. Profound engineering services suit even your most exceptional needs. Broad set of high-performant modular I/O slot cards, I/O interface modules, and simulation tools for measurement and simulation of bus data. A proven and widely used tool for development, validation, and visualization of ADAS and automated driving features. Our tool for testing ECU software during the implementation stage, both for real hardware and on PC. Innovative engineering methods, sophisticated processes, proven standards worldwide. Paving the way towards automated driving with scalable, cost- and time-efficient testing of ECU software functionality. Augmented reality for the automotive head-up display, developed in EB Assist ADTF.